The 1976 Spanish Grand Prix (formally the XXII Gran Premio de España) was a Formula One motor race held at the Circuito del Jarama in Madrid, Spain on 2 May 1976. The race was the fourth round of the 1976 Formula One season. 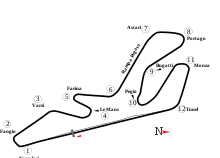 The race was the 22nd Spanish Grand Prix and the sixth to be held at Jarama. The race was held over 75 laps of the 3.404-kilometre circuit for a total race distance of 255 kilometres. Initially the declared winner was Austrian Ferrari driver Niki Lauda driving a Ferrari 312T2 extending his Drivers' Championship lead to 23 points after first across the line James Hunt had his McLaren M23 disqualified in post-race scrutineering. Swedish driver Gunnar Nilsson took his Lotus 77 to second place with Carlos Reutemann finishing third in his Brabham BT44B. McLaren appealed the disqualification and in July the appeal was upheld and Hunt re-instated as winner of the Spanish Grand Prix. As the European season began, new cars were launched as organisers were due to start enforcing new regulations for 1976 having allowed an easing in period over the first three races. There was a big talking point as the Tyrrell team entered a new P34 six-wheeler for Patrick Depailler. Depailler was on the pace and qualified third, behind Hunt and Lauda. Lauda, driving with broken ribs after an accident driving a tractor once again beat Hunt off the line at the start and led for the first third of the race. Depailler, after a slow start, was running fourth behind Mass when he spun off and crashed with brake problems. Just before mid-race, the McLarens of Hunt and Mass found another gear and drove past Lauda, but towards the end of the race, Mass had to retire with an engine failure. Hunt took his first win of the season, with Lauda second and Gunnar Nilsson's Lotus third. After the race, scrutineers examined the bulk of the field and Hunt was disqualified because his McLaren was found to be too wide and Lauda was declared the winner. One of the new rules for 1976 defined how wide a Formula One car could be based on the widest car of the 1975 season along with the new smaller tyre sizes. McLaren appealed on the basis of measuring the car when the tyres were still warm after the race and when they were cold stating Goodyear tyres expand during the race. Two months after the race, McLaren's appeal was successful and Hunt was reinstated as the winner of the Spanish Grand Prix. Chris Amon's 5th place made him the last driver from New Zealand to score points in Formula One until Brendon Hartley finished 10th in the 2018 Azerbaijan Grand Prix some 42 years later. Points shown represent points standings after the race when Hunt was disqualified. His nine points for winning the race were not re-instated until much later in the season. Note 2: Results as shown are before any changes due to decision of stewards. ^ Lang, Mike (1983). Grand Prix! Vol 3. Haynes Publishing Group. p. 117. ISBN 0-85429-380-9. ^ Lang, Mike (1983). Grand Prix! Vol 3. Haynes Publishing Group. p. 119. ISBN 0-85429-380-9. ^ "Grand Prix results: Spanish GP, 1976". grandprix.com. Retrieved 23 December 2015. ^ "1976 Spanish Grand Prix". formula1.com. Archived from the original on 5 December 2014. Retrieved 23 December 2015. ^ a b "Spain 1976 - Championship • STATS F1". www.statsf1.com. Retrieved 20 March 2019.